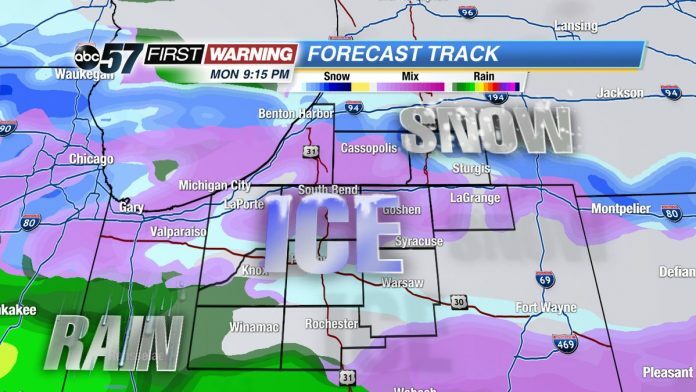 Slick roads are, once again, a reality in Michiana, due to freezing rain and mixed precipitation. The system moved in from south to north and created very slick roads during the overnight hours of Tuesday, Feb. 12. Conditions were so slick, St. Joseph County Police asked residents to stay off the roads, unless it was an emergency. The county also pulled its salt trucks off the roads. Freezing rain starts to turn to rain on Tuesday morning with scattered rain showers on and off through the day. As the next round of rain moves in Tuesday evening, colder air moves in as well, turning rain to snow for Wednesday morning. Scattered snow showers will last through the morning commute. Very windy conditions on Wednesday could lead to isolated power outages. Tuesday: Scattered rain showers turning snow late, breezy, high of 38. Wednesday: AM scattered snow and mostly cloudy, windy, highs near 30. Thursday: A 40 percent chance of rain after 1pm. Mostly cloudy, with a high near 41. Friday: Rain and snow likely, becoming all snow after 3pm. Cloudy, with a high near 36. Chance of precipitation is 70%. Saturday: Partly sunny, with a high near 25. Sunday: A chance of snow showers. Mostly cloudy, with a high near 25.